Instantel Rentals – SubTerra, Inc.
SubTerra maintains a large fleet of Instantel® MiniMate© and MicroMate© Seismographs & Automated Monitoring Systems available for lease in daily, monthly, or annual terms. Four recording channels for one triaxial geophone (ISEE or DIN) and an ISEE linear microphone. Dedicated function keys and intuitive menu enable quick and easy setup. Sample rates from 512 to 65 S/s per channel, independent of record times. Instantel Histogram Combo™ mode allows capturing thousands of full waveform records while recording in histogram mode. Auto Call Home™ feature automates remote monitoring applications. Non-volatile memory with standard 8000-plus event storage capacity. Full Waveform Event capacity with the standard memory, store up to 1000 events of one second duration at sample rates up to 2048 S/s. Full Waveform Event Analysis: Time of the event, trigger source, peak particle velocity (PPV) for each vibration channel, peak air overpressure, zero crossing (ZC) frequencies, peak vector sum (PVS), maximum acceleration, maximum displacement and more, all available on the unit in the field. Optional GPS: Connect the compatible Magellan Explorist 310, Global Positioning System (GPS), to the Micromate to download and include the vibration source and sensor location coordinates on event reports. The Instantel Minimate Plus has become a favorite of Contractors,Consultants, Engineers and Blasters because it offers unrivaled features and versatility in a rugged and easy-to-use package. 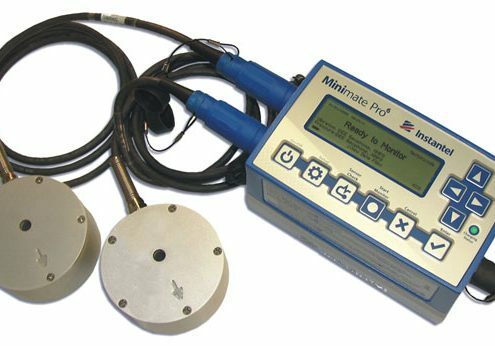 Versatile – When used as a compliance monitor, the Minimate Plus is a perfect fit in any monitoring application. It is available with external ground sensors for maximum flexibility, or with the geophone components housed in the case, for a compact and economical system. You also have the option to add four more channels, so you can have two complete, standard seismographs with a single monitor. For the most demanding monitoring applications use Instantel’s Blastware ® Advanced Software to unlock the full capabilities of the Minimate Plus. 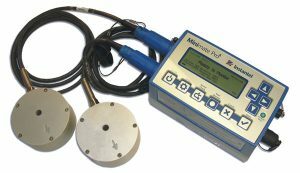 You can configure the velocity and microphone channels as independent non-sensor specific data acquisition channels for a variety of sensors including hydrophones, accelerometers and even crack monitors. Mail feature of Blastware distributes the information to multiple e-mails, internet or any text messaging devices. Easy to use -Even with all of these features, the Minimate Plus is still easy for anyone to use. A high-contrast LCD, eight-key tactile keypad, coupled with simple menu-driven operations, provides complete control and confidence. • Histogram Combo TM mode allows capture of full waveform records while recording in histogram mode. • Autocall Home feature automates remote monitoring applications. • Sample rates from 1024 to 16K samples per second, per channel with up to 65K available on a single channel. • Available 8-channel option allows for two standard geophones and two microphones to be operated from one Minimate Plus. • Non-volatile memory with standard 300 event storage capacity (optional 1500 event capacity). 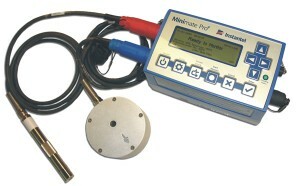 • Records waveform events up to 500 seconds long. • Zero dead-time between events means you never miss an event. 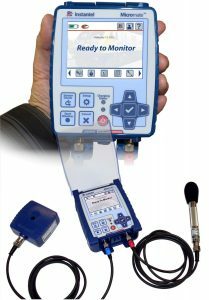 • Αny channel can be matched to a wide variety of sensors – geophones, accelerometers or hydrophones. Copyright© SubTerra, Inc. 1991-2017. All Rights Reserved.